A practical example of a method for analyzing and swing trading energy markets. Guest post by Michael Gouvalaris, author of The Trading Playbook: Two rule-based plans for day trading and swing trading. The Trading Playbook was written for traders of all levels who desire to learn a straightforward method of analyzing the market and spotting quality support and resistance levels. The book is broken into two sections, one for day traders and one for swing traders. Today we will focus on the Swing Trading component as we break down the recent moves in the Energy sector, using the Select SPDR etf XLE. This methodology incorporates pattern recognition in identifying support and resistance and the strength of the trend. However this will be different from the chart patterns you typically see in traditional Technical Analysis books. The chart patterns that we will be discussing are derived from supply and demand only. As I find these to be more reliable in spotting support/resistance and analyzing the trend. While in the midst of a bull market in stocks that has lasted for six years, it can become increasingly difficult to find certain sectors or individual stocks that may be trading at or below perceived fair value. However due to the price of Oil, which has fell some 60% since July 2014, the Energy sector has garnered much attention recently so I figured this would be a good market to use for an example. This first chart above (Fig 1) shows the price action in the Energy sector. In 2014 price broke above its 2008 highs (red horizontal line) to make a new all-time high. 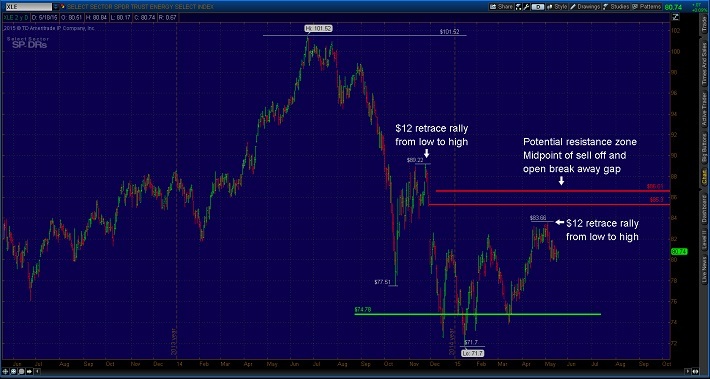 Price continued to advance about 10% higher before topping out at $101.52. 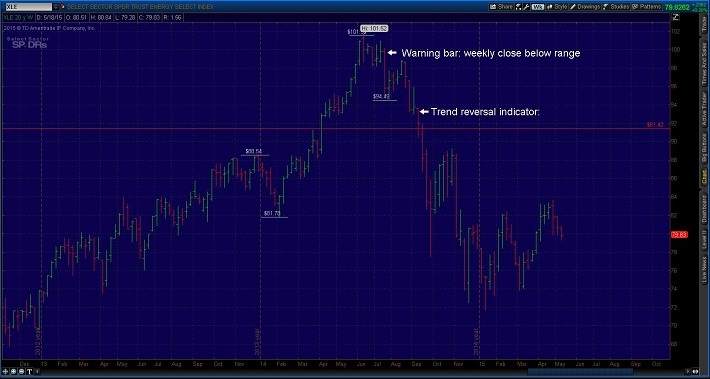 The first warning sign was a weekly close well below the low of the prior trading range. These kinds of supply/demand shifts can be a warning sign of a potential change in trend. The rule of thumb when these signals are generated, is to expect a counter trend move of AT LEAST the size of the most recent multi-bar counter trend move (again specific to what time frame you are using). In this case we are using the weekly bar chart, so the last multi-week correction at that point took place in early 2014 and produced a roughly $7 point drop in XLE. So if one was bullish XLE, one could buy support around $95, which was $7 points down from its all-time highs and coincided with a previous weekly swing high. It was good enough to produce a retrace rally back to the midpoint of the correction. For the short trade, there wasn’t a whole lot of opportunity left, as the large red bar dropped right into the support target below. However if one was still bearish on energy and anticipated a break in the uptrend, you would still place the trade (or short the midpoint retracement), keep your stop above the high of the signal bar, and watch what happened. In this case, the short trade would have worked just fine as price eventually made a new short term low and broke the uptrend pattern by creating a counter trend move that was greater in size than the previous. 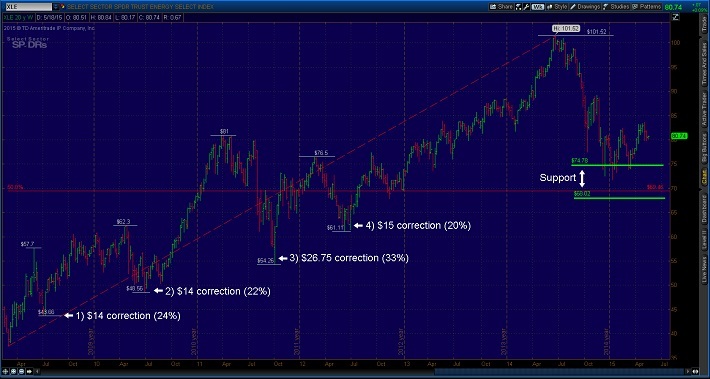 This chart (Fig 2) looks at the bigger corrections since the market bottom of 2009. We can look for additional patterns to come up with some realistic expectations and anticipate future support. Here we see that the energy sector has experienced four separate corrections since 2009. I have highlighted each one for reference. Three out of the four corrections were of the $14-$15 or 20%-24% variety while the biggest correction came in 2011 and that equated to a $26.75 drop or about 33%. So the next expectation for shorts would be a continuation of selling to take price down at least $14-$15 points below its swing high. This proved to be a successful target for shorts but not such a great support level to initiate new longs as sellers took complete control of the trend. Of course the next target/support zone then came in just below $75. We now find ourselves in a position where the Energy sector has matched the size (by $ amount) of the 2011 correction. I have highlighted this price level ($74.78) as it’s the top green horizontal line. For now price has stabilized around this level however in the event of further weakness the next major area of support, as I see it, comes in around the $68 – $69.50 area. The $68 price level would match the size of the 2011 correction in terms of percentages (33%) and so I have highlighted it as the bottom green horizontal line. While the $69.50 level happens to be the midpoint of the entire bull market run over the last 5 years and it is represented as the red horizontal line on the chart. Next we can gauge the level of demand that comes in off of support to get an indication of whether the buyers will regain control of not. Now just like we gauged the counter trend movements as price was in an uptrend, we can now do the same for the retrace rallies to spot potential resistance and gauge the strength of the prevailing trend. In the short term it looks as if the retrace rally may be running into some resistance. The last retrace found support near the 2012 highs and pushed prices back up $12 points before finding resistance and a new low was formed in early 2015. Over the next few months the Energy sector has been pushing higher as Oil prices has gone from $40 to $60 dollars a barrel, for roughly a 50% gain. Recently XLE has run into resistance as it has matched the $12 rally length of the previous retrace rally in late 2014. Add in some confluence above at $85.30 (which happens to be the breakaway gap of late November 2014) and $86.61 (which happens to be the midpoint of the entire bear market) as potential resistance points. A failure by buyers to push prices higher and thus break the downside momentum, likely means that prices will fall back down to at least $77.50, which represents the last major swing low. This would also setup for a price drop down to the lower support zone in the area of $68 to 69.50. So for short term traders, taking profits would likely be the best option available here. For investors, purchases in the support zone sets up a good probability for growth over the long term. 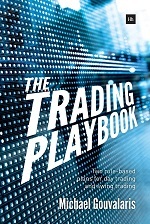 Michael Gouvalaris is author of The Trading Playbook: Two rule-based plans for day trading and swing trading. Free Trading Educational Resources - This is a selection of free resources that are available from a massive library of educational materials and resources from the worlds largest market forecasting sevice. Free Elliott Wave International Resources. Premium Market Analysis - EWI provide market analysis of all the worlds largest markets in pick and mix packages to suit individual traders needs, including their premium ETF trading alerts service. Find out more about EWI's premium market analysis sevices. MarketClub - There are too many features to mention them all here but MarketClub is one of the leading resources providers since 1995. Create multiple portfolios, market scanning, email alerts, charting tools and analysis, talking charts on 250,000 markets , instant trend analysis, Trade Triangles trading system tells you when to get in and out of the market. Get a 30 day trial membership for just $8.95 when you use this link. Free Market Commentary and Analysis - Free daily market commentary and analysis by email and video from highly experienced floor trader Adam Hewison covering stocks, indices, commodities, and metals. Get the free market commentary and analysis. EWI's new 50-page eBook, The Ultimate Technical Analysis Handbook, will show you the various methods of technical analysis they use every day and teach you how to use these powerful tools for yourself.